When I’m surrounded by moving boxes and cleaning supplies and the like, one of the thoughts that occurs to me is: GOSH, I’m glad I took tons of screenshots of cloaks the other day. So now Cloak Week (or, Period of Time) continues! 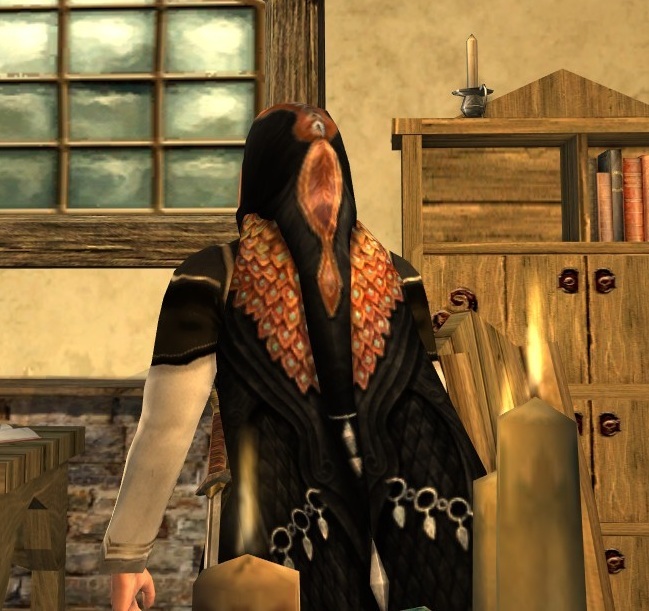 The Wood-Wanderer’s Cloak is a LOTRO Store cosmetic, available in both hooded and non-hooded versions. 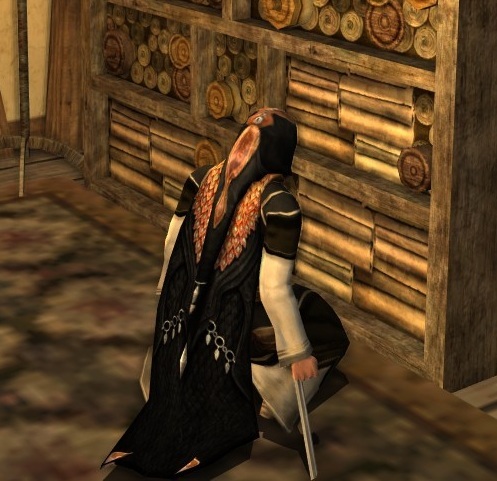 Do check out that link from LOTRO Life, since it shows the cloak in a lighter color where you can see a few more details. And here, in my usual shout-out to Cosmetic Lotro’s awesome work, is the non-hooded version in green on a very fierce Dwarf. I, of course…went black. You should see my wardrobe in real life, people. As a Blogger of a Certain Age, I went to high school in the late 80s. Therefore, everything I own is either black or a whackadoodle neon bright. But we’re here to talk about the CLOAKS. 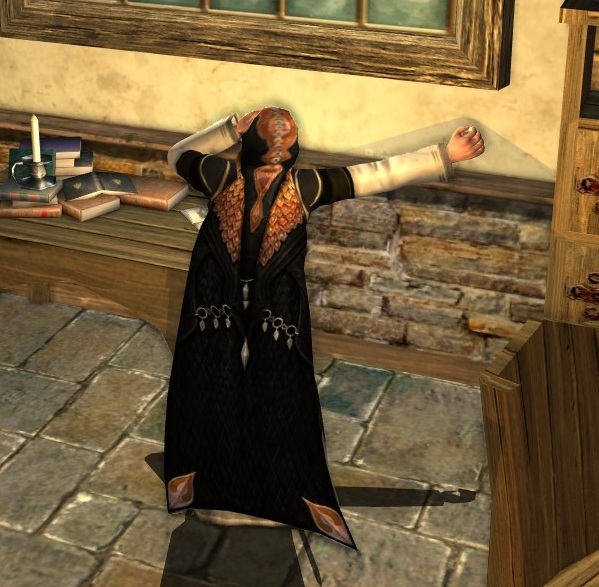 Weric, my spokesMan, wears the cloak in a scholarly setting, while looking for some scroll that will give him a bit more esoteric healer’s knowledge, perhaps enough to save a life. As you can tell from the links above, the only parts of the cloak that do not dye are the hood, shoulder, and hem details, as well as the silver weights and rings. The rest of the cloak dyes to a deep, saturated extent that I find rare among cosmetics. As the candles flicker throughout the night, the Scholar searches for lore. Lol girl, you do an awesome job. Black is my colour & this cloak is a favorite. Love the hooded version!